Two refugees have attempted to commit suicide in the center of Athens, hanging themselves from a tree with makeshift nooses. The men lost consciousness, but were rushed to hospital after other asylum seekers rushed in to save them. 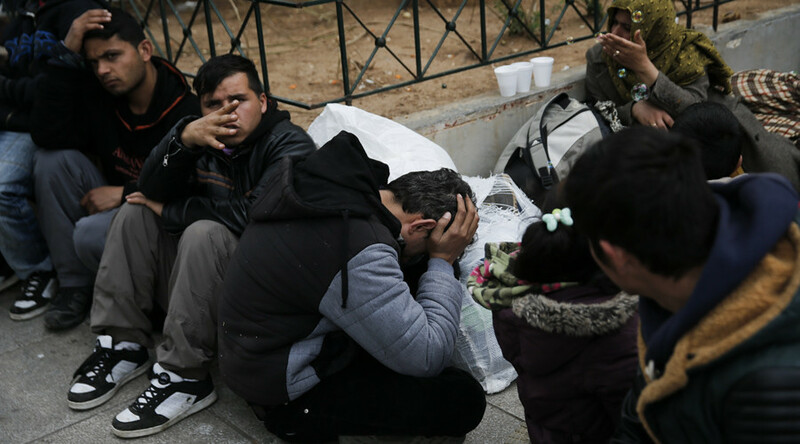 The men, both in their mid-20s from either Syria or Pakistan, attempted to hang themselves from a tree in Athens' Victoria Square, where about 100 refugees have set up camp in recent days. Local media reported that the men made the nooses out of pieces of fabric. Other refugees swooped in to save the men, and ambulances soon arrived at the scene. The two were taken to hospital for treatment. They have since been released in good condition, according to an official from Greece's National Centre for Health Operations. A police spokesperson also told Al Jazeera that the men are in good health. He added that they are “probably” from Pakistan, but that such information had not been verified because the they were not carrying identification. A hospital source said the two are believed to be brothers. "It [the suicide attempt] happened at midday in Victoria Square," the police spokesperson said, "they probably wanted to show their objection with the fact that they cannot leave [Greece]." More than 20,000 migrants and refugees have become trapped in Greece after borders along the Balkans route to central and northern Europe were shut down. Athens recalled its ambassador to Austria on Thursday, angry at Vienna's decision to close the country's borders. It has threatened to block all EU decision-making until a solution is found. The summoning came after Austria hosted a meeting with Balkan states on the refugee issue, to which Greece was not invited. This year alone, more than 100,000 people have crossed the Mediterranean to Greece and Italy, and 413 have lost their lives during the attempt, the International Organization for Migration (IOM) said on Tuesday. Greece has received about a million arrivals of refugees since January 2015, as part of a wider EU refugee crisis which the bloc is struggling to bring under control.